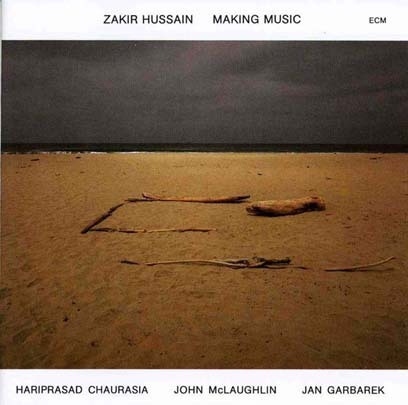 Zakir Hussain is a poet of the tabla, but as this album makes clear, his interests extend far beyond Indian classical music. He’s joined here by an international cast of players, each of whom lends a different influence to the proceedings. While the dynamic remains largely on the low end, preserving the music’s meditative quality, there are elements of jazz (Jan Garbarek’s liquid sax lines) and folk (John McLaughlin’s pastoral acoustic guitar). These more Western influences contrast nicely with Hussain’s tablas, which seem to tell a slowly unfolding story to the listener. Famed flautist Hariprasad Chaurasia navigates the middle ground between Garbarek’s jazzy explorations and the traditional Indian bent of Hussain. While MAKING MUSIC would fit comfortably alongside the languid, atmospheric jazz that makes up the bulk of ECM’s catalogue, Hussain’s music is a singular animal–an utterly unique hybrid.